The 40 S&W has become an exceedingly popular choice for personal protection since its relatively recent introduction, owing both to its great power and arguably superior performance over other like-sized calibers. 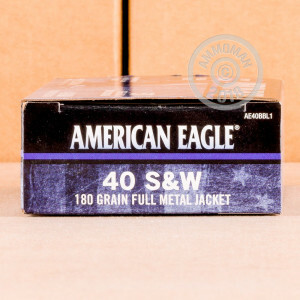 If you’re a 40 S&W aficionado, then you’ll enjoy this Federal American Eagle round’s reliable performance coupled with its appealing price tag. 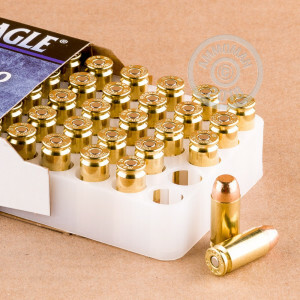 Its 180 grain bullet is the original weight for its caliber, and sports a hard full metal jacket which assures both that it will feed smoothly in your pistol and preserve its accuracy over the course of your training session. 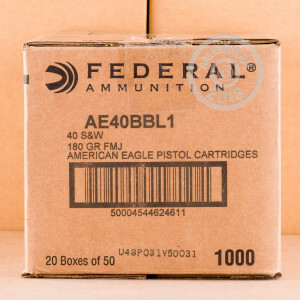 Its brass casing is resistant to corrosion, and its primer is altogether non-corrosive, so you’ll get as much value out of these rounds on the day you receive them as you will ten years from now. Whether you are a law enforcement professional or would simply like to support the community, you will take great satisfaction in the knowledge that Federal donates a portion of the proceeds from this ammunition to Concerns of Police Survivors, a non-profit organization which helps the families of police officers who’ve made the ultimate sacrifice in their lines of duty.